SAHARA CARFAX Certified Clean- No Accidents - Fully Serviced QUALITY CERTIFIED up to 10 YEARS 100,000 MILES WARRANTY This Jeep includes: CONNECTIVITY GROUP Leather Steering Wheel Bluetooth Connection Auxiliary Audio Input MP3 Player 4-SPEED AUTOMATIC TRANSMISSION 4-Speed A/T A/T 3.8L OHV 12-VALVE SMPI V6 ENGINE (STD) V6 Cylinder Engine Gasoline Fuel MEDIA CENTER 730N Navigation System CD Player AM/FM Stereo Satellite Radio Bluetooth Connection Auxiliary Audio Input Hard Disk Drive Media Storage MP3 Player *Note - For third party subscriptions or services, please contact the dealer for more information. * This a worry-free vehicle that has passed our certification process. With this exceptional SUV, you'll get sport, utility, and comfort. 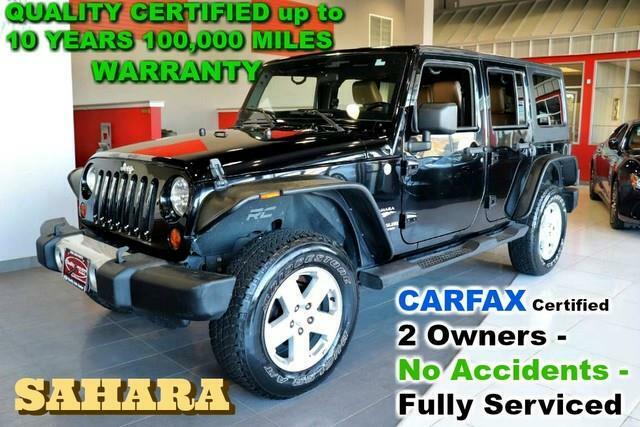 This Jeep Wrangler Unlimited Sahara - Leather - Navigation - CARFAX Certified 2 Owners - No Accidents - Fully Serviced - QUALITY CERTIFIED up to 10 YEARS 100,000 MILES WARRANTY comes equipped with 4 wheel drive, which means no limitations as to how or where you can drive. Different terrains and varying weather conditions will have no effect as to how this vehicle performs. In addition to being well-cared for, this Jeep Wrangler Unlimited has very low mileage making it a rare find. The best part about navigation systems like the one that comes in this car? You don't have to try to fold them up and stuff them back into the glove box. More information about the 2011 Jeep Wrangler Unlimited: With prices starting at a little over $20,000 and standard 4-wheel drive, the classic Wrangler is one of the best SUVs for the money in its class. The 6-speed manual transmission helps the Wrangler achieve a not-too-shabby 15 mpg city and 19 mpg highway rating. Inside, the multi-function steering wheel and 6-speaker sound system are standard across the board. With a rugged rock-crawler like this, it's important to note for new shoppers that even at its least expensive, the Wrangler's doors are still all metal with roll-up windows ? and they can still be taken off completely. Interesting features of this model are Iconic exterior remains, new technology in a simple SUV, and interior gets needed upgrade No Credit / Bad Credit / No Paystubs, No problem !! ! All Approved ! Everyone drives ! CLEAN, GORGEOUS, LOW MILES, SHOWROOM CONDITION. CALL NOW QUALITY CERTIFIED up to 10 YEARS 100,000 MILE WARRANTY , To Certify a vehicle, there will be an additional cost for Certification. CALL NOW For details. STUNNING AGGRESSIVE LOOK ON THIS BEAUTIFUL--Call today to schedule a test drive... Good Credit/Bad Credit/No problem!!!! Get paid cash? No problem!! 100% Credit Approval with interest rates starting at 2.49% for qualified customers, our rates will not be beaten. We price our cars at wholesale price to guarantee the best deals for our customers. Our inventory moves quick, please call to confirm the availability of the vehicle of your interest Springfield location 973-564-0112. This vehicle is located at our SPRINGFIELD location. Come visit our new showroom in Springfield NJ.